There are many things to love about fall: the gorgeous colors of the changing leaves, the cooler temperatures, having family around, and all that pumpkin and spice and everything nice. But the fall season can also be a bit stressful. With the holidays right around the corner, your stress level rises just a little more each day. And the impending darkness of winter approaches as each day loses just a little more light. 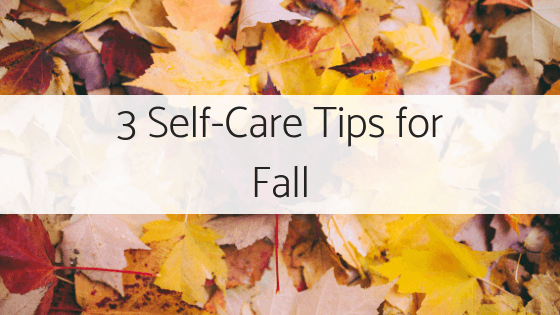 And that’s why we’ve compiled a list of self-care tips for the fall, so that you can find ways to center yourself in the midst of an often stressful season. An easy way to de-stress yourself is through the use of essential oils. Good for a whole host of different ailments, essential oils can have a soothing, calming effect on the mind and body. The two ways to work essential oils into your self-care routine are aromatherapy and topical use. A good diffuser will scent the air, and as you breathe in, you will feel lighter and more relaxed. Essential oils like chamomile, lavender, peppermint, and sage are good choices to ease anxiety. You can also use essential oils on your body by rubbing the oil into your skin. It has been proven that the decrease of light during the fall and winter season can affect your mood. For your self-care routine, be sure to bring some light into your life. Salt lamps and candles can add a bit of light to your relaxation space while spending time with a light box can vastly improve your mood. It’s also important to not let the darkness stop you from leaving your house. Spending time with close friends is an important part of any self-care routine. There’s nothing like sharing a laugh with a good friend to lift your spirits or having someone who will listen to your worries and help you through the darker times. Good self-care means paying attention to what you’re eating. The fall season is a good time to add warm, comforting foods to your diet. Try cooking with thyme and sage, which can boost your immune system. Ginger and chili are also good herbs that will warm up your body. Also, varying your diet with different colored foods can give your diet the diversity it needs.